Do you live in Maitland? 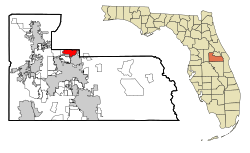 Maitland is a suburban city in Orange County, Florida, United States, part of the Greater Metro Orlando area. The population was 15,751 at the 2010 census. The area's history is exhibited at the Maitland Historical Museum. The city also hosts the Maitland Art Center, and example of Mayan Revival architecture and Fantasy Architecture, theMaitland Telephone Museum and the William H. Waterhouse House Museum. A SunRail station is located in Maitland on Highway 17-92. The city is named for Fort Maitland.